Captain America is not taken lightly in this house. We are huge Marvel fans – comic books, movies, video games, the whole package. Captain America though is my husband’s all time favorite. As a kid, he latched onto the idea that this little scrawny kid that no one believed in could become a hero. On the day of our wedding, he wore Captain America cufflinks that gave him, and we have our fair share of Cap memorabilia around the house. So of course we had a little fun with the release of Captain America: The Winter Soldier DVD release – especially since I think it has been the BEST Cap movie so far. 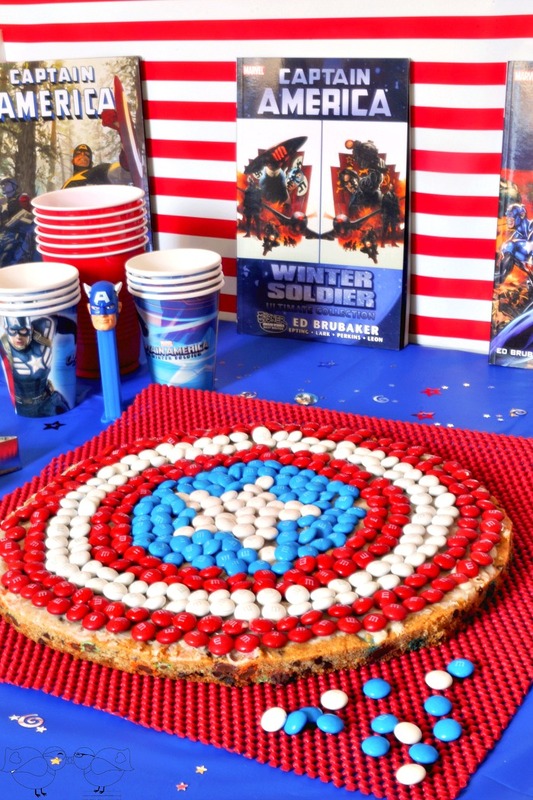 Since I never got to make my husband a giant M&M cookie for his birthday (he had appendicitis over his birthday), I decided to seize the moment and go all out with a Captain America Shield Giant M&M’s® Cookie! Baking this and coming home from Walmart with the DVD basically cinches my nomination for the Best Wife Ever in his eyes. I love how the backdrop and tablecloth really pop in this tablescape! They also only cost me a few dollars. The tablecloth is an inexpensive plastic tablecloth in blue while the backdrop is red and white striped wrapping paper. Yep, wrapping paper! When planning a party, I always think about the colors that would work for the theme: American red, white and blue in this case. Then, I walk up and down every aisle in the party or craft store. You never know what you will find. In my case, it was this striped wrapping paper that reminded me of the American flag. Cap would totally appreciate that! I felt like the table needed a bit more height to the party decor, so I cut out three stars from blue card stock and used a white paint pen to write CAP on them. 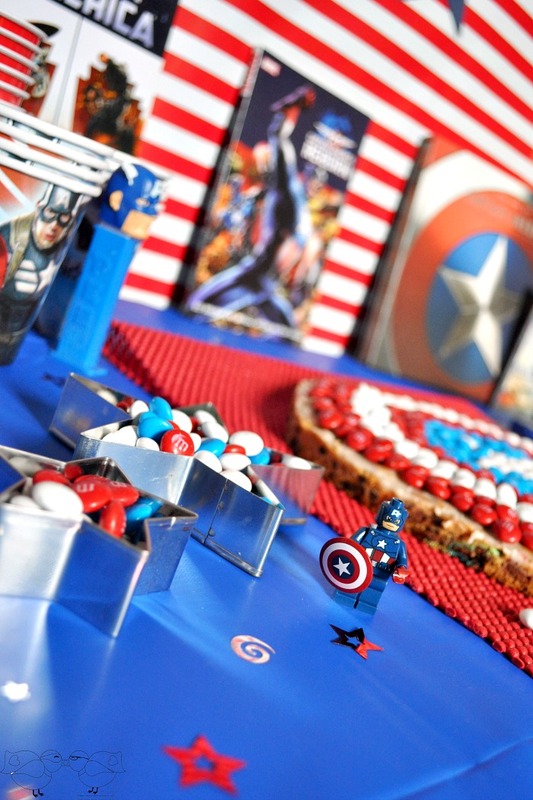 We had a lot of the little party elements around the house, like the Cap Pez dispenser, the wooden peg doll I painted for our wedding, and the Lego Captain America which is probably my FAVE little detail on the table. I also really like how the star cookie cutters looked on the table filled up with M&Ms. Did you also see the Winter Soldier comic book in the back? My husband was so excited to show me that we owned it as I set everything up. 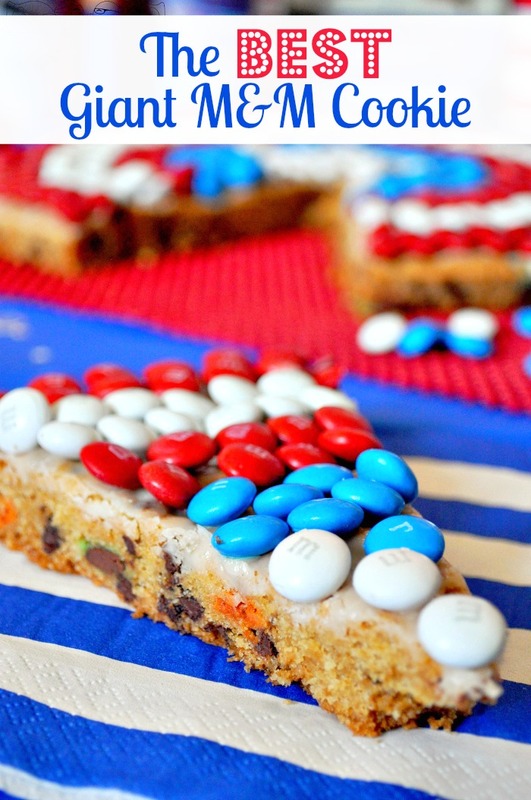 Now – for the yummy part : The Best Giant M&M Cookie! I am not normally a fan of giant cookies. I feel like they are never consistent and can often be too dry. This cookie is super soft without being mushy in the middle. My husband came back for a second slice in the same evening. Add a sheet of parchment paper to a 12 inch round pizza pan. Cream the butter, sugar, and brown sugar sugar together. I prefer doing this by hand but you could also use a mixer. Add flour, baking soda and salt into the batter and stir until well blended. Place all of the batter onto the parchment paper and form it into a circle. Make sure to stop about 1.5 inches from the rim and to have the batter be as even in thickness as possible. If you are not adding a decorative design to the top, you might want to press some M&M’s lightly into the top for decorative reasons. Once baked, you will definitely have that pop of color on top. Bake on the center rack for 30 minutes and check. You want your cookie to be golden around edges and set in the middle. 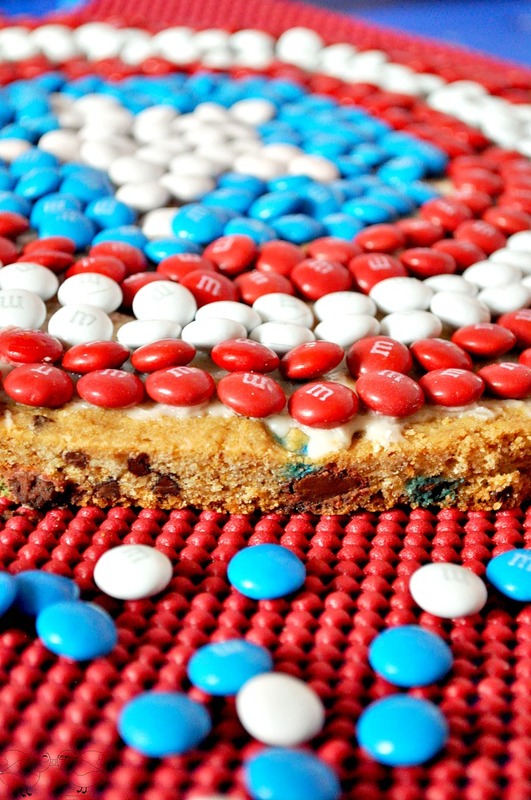 If decorating, let your cookie cool for at least 15 minutes before adding the top M&Ms. When you add the M&Ms and the cookie is still very hot, the candy coating will crack slightly. And presto – homemade giant cookie awesomeness! I definitely suggest drinking it with a cold cup of milk. 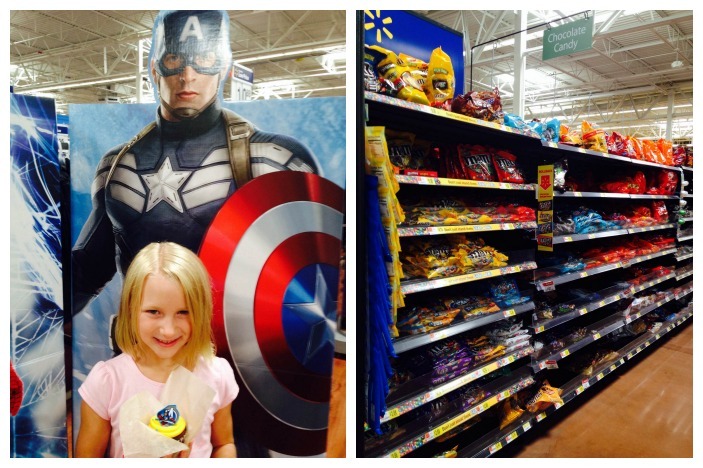 Our niece B is also a HUGE Captain America fan. She has probably watched Avengers more than any 7 year old girl I know. This made her the perfect date for a fun Walmart Retailtainment event. She was able to pick out a Marvel cupcake, choosing the one with a Captain America ring of course. She also got to take her picture with Cap! B loves princesses and totally wants to be Anna for Halloween (can we say the year of Frozen? ), but I’ve always found it awesome how much she loves superheroes, too. They are amazing role models for kids. Plus, she is a pretty tough cookie. If you head over to HeroesEatM&Ms, you can take a fun quiz to see which M&M character you are. Plus, you will get to see tons of Marvel ideas in celebration of Marvel Superhero September! Who is YOUR favorite superhero?! I really want to know! It might even show up on the blog in the future for a different party table because I just love celebrating heroes. Love giant cookies…ok or small ones too. But that one looks amazing! AMAZED that you had the patience to M&M the Captain America badge! The things we do for our kids! Beautiful colors, great idea! This looks like a great party and those cookies, wow! I’d they look really good! Maggie! That MM cookie is beautiful! I bet it was an amazing party, good job!! Such a fun cookie and party! yum!! that cookie looks amazing!! I never think to make cookies like this!! You know I never think to make giant cookies. 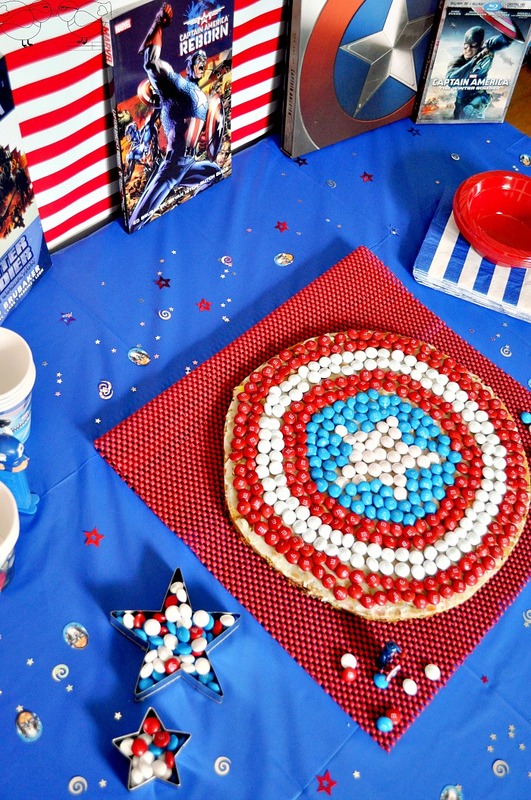 When I was a teenager, I’d make a giant pizza cookie for friends and family all the time. I love the shield made out of M&Ms! That looks like a giant cookie for sure! Yum! Wow! That is an amazing cookie!! Even though my kids are older, I have a feeling a cookie like that would still be a big hit here! What a fun party idea! And that cookie looks awesome! I could go for one right now! Forget about my kids, I would love this party!! Ok, ok, they can come too. It looks awesome! I love your parties…..they are always so unique!